The solarpod from Thousand Suns is marketed as a self sufficient portable energy source; ideal for boaters, festival goers and campers! 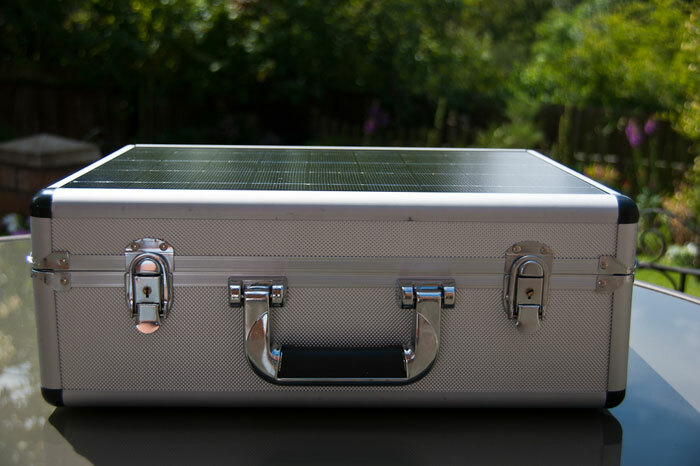 The solarpod is cleverly packaged in a robust looking flight case and our test model was supplied with the optional integrated 15 watt solar panel built into its lid. On the top of the unit there is an indicator for both the battery and the charging input. The battery level side lights up with up to 5 blue LED’s to indicate it’s current charge start whilst on the other end of the scale there are up to 5 amber coloured LED’s to show how much power is incoming from the solar panel or mains charger. There is also an On/Off switch for the device as well as a separate On/Off switch for the inverter that powers the 230 volt mains socket. At the front of the unit there are the various output sockets on the unit. These include a 400 watt 13 amp 230v UK plug socket, 2 x 5 volt USB sockets and a 12 volt standard car cigarette lighter socket. 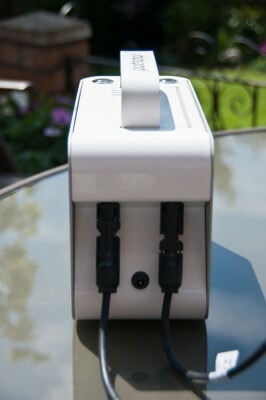 The rear of the unit houses the 2 types of input sockets. 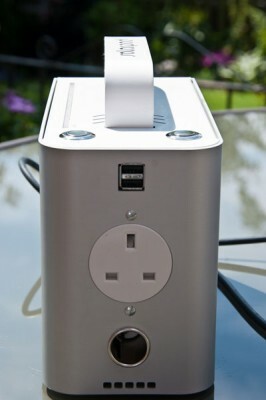 This is either the 5 amp mains power adapter or connections for a solar panel. 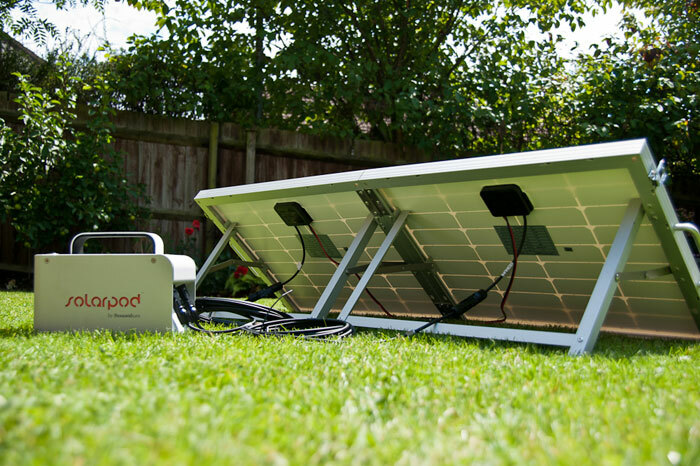 For our review we were supplied with the optional 60 watt foldable solar panel and for anyone wanting to make the most of the solarpod we would certainly recommend that people get this as part of their package. 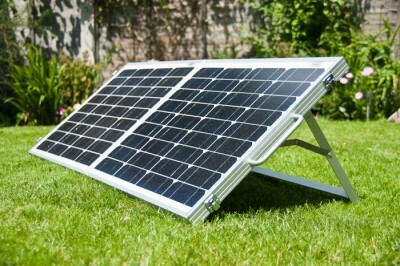 The solar panel simply unclips, folds out and then there are fold down legs to allow you to best angle the solar panel for maximum solar exposure. You simply connect the two panels together and then connect the supplied leads to the solarpod, it really is that simple! In our tests with the optional 60 watt foldable solar panel even with a reasonably cloudy sky we were impressively seeing 2 amber LED’s and with full sun this was hitting 5 LED’s. To complete a full charge via the solar panel will take approximately 6 hours whilst the 5 amp mains charger can do it in approximately 4 hours. For the environmentally conscious person it’s far more rewarding to use the solar panel to provide you with free and clean electricity! The unit isn’t silent when it’s operating so bear this in mind if you plan to use it somewhere where you will be sleeping. It’s obviously not as loud as a petrol generator but there is an audible sound from the onboard fan, similar to that which you can hear at the back of any standard PC. These are impressive numbers and show how versatile this product can be. If you have access to more sunlight then you can easily keep the charge topped up to deliver power for a prolonged period. The battery life on the unit is quoted at around 10 years as after 1500 charge and discharge cycles the batteries performance will have dropped to something like 85%. Thank you to Jon Cook of Work Smarter, not Harder for writing the review. The SolarPod is available from Amazon for £599, or for the same price directly from Thousand Suns. Disclaimer: Although Jon was given this gadget to review, it has in no way influenced his opinions in this product review. This review reflects his personal and honest perspective on this gadget, and this perspective has not been biased in any way.